The Walden Farms Calorie Free Salad Dressings are now available in all flavors! Zero calories, zero carbs, zero fat, gluten free, and an abundance of flavors. Walden Farms has made some exciting new changes to their calorie free Pasta Sauces. 2. New recipes! The Marinara and the Scampi recipes have been reformulated for even better taste. 3. New names! The Marinara is now called Tomato & Basil. The scampi is now called Garlic & Herb. Take a stroll through your local supermarket, and you’ll notice a ton of new gluten free foods. Find out what a gluten free diet is all about, and whether eating gluten free might be a good dietary decision for you and your family. Gluten is a type of protein that is commonly found in most types of grain, in particular wheat, rye and barley. Because gluten is found in most cereal grains then foods such as breads, cakes, breakfast cereals and many types of processed food where gluten is as a thickener need to be avoided by those who are sensitive to gluten. Gluten can also pop up in other unexpected places such as medicines, cosmetics, lip-balm, and vitamin tablets where it’s used as a binding or bulking agent. Sufferers of the digestive disorder Celiac disease need to undertake a gluten free diet as gluten can cause severe damage to the small intestine. This damage prevents the body from absorbing the vital nutrients, vitamins and minerals needed from food, without these nutrients the body becomes prone to illness and fatigue. Symptoms of Celiac disease include diarrhea, abdominal pains, weight loss, general weakness and even malnutrition. Those with Celiac disease are also more likely to suffer malabsorption problems with internal organs such as the liver and gall bladder, as well as osteoporosis, infertility, anemia, tooth enamel loss and internal bleeding. Untreated Celiac disease can be life threatening. It’s thought that almost 1 in 133 Americans suffer from Celiac disease, although 97% of sufferers are unaware they have the disease. Celiac is a hereditary disease that usually presents itself in early infancy. However more and more adults are being diagnosed with Celiac disease, in particular people between the ages of 30 and 45. It is prudent to get yourself checked out by your doctor if you think you have a wheat intolerance, as many people have been found to have undetected Celiac disease this way. A simple blood test can detect whether a patient is likely to have Celiac disease with a follow up biopsy of the small intestine taken. Celiac Disease affects both men and women equally and you are more likely to have it if a close member of your family is affected by it. Studies show that those of Northern European descent are more likely to have Celiac disease, along with those from parts of India, Pakistan, North Africa and the Middle East. As yet there is no known cure for Celiac disease. The only way to manage it is to eat a gluten free diet. Many people now believe that gluten free diets for children can be beneficial for those on the Autism spectrum. While no clinical trials have taken place to confirm or deny this there is a definite growing trend for a gluten free diet to treat a number of ailments. From Parkinson’s disease to diabetes, multiple sclerosis to arthritis, research is showing that an improved digestive system leads to better overall health and sufferers of these, and many other diseases, are showing less symptoms and faster recovery times. A gluten free diet will be low in net carbs and low GI. It will also, by default, be high in protein which in turn makes it a very good diet plan for losing weight, providing that you’re not trading in your gluten for high sugar content food instead. Thankfully there are lots of gluten free alternatives on the market, including chips, bagels, cookies, brownies, breads, cereals and pizza crusts. We at Linda’s Diet Delights are online leaders in the Gluten-free market and stock a large range of gluten-free foods. Thanks for reading our article! Did you know that there are many great-tasting gluten free food products on the market today that can make sticking to your gluten free diet a breeze? Linda’s Diet Delites is a leading online supplier of low carb food products, offering a wide selection at affordable prices. Take a look! Both Low Carb and Low GI (glycemic index) diets have taken the world by storm. Both have been proven to be highly efficient at reducing weight and improving health, and both concentrate of how much glucose the body produces. 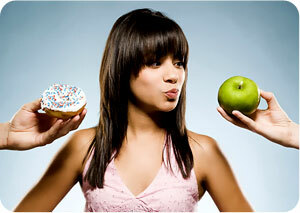 Whilst both diets centre around restricting carbohydrate intake there are some significant differences between the two. The Low Carb diet was pioneered by US Cardiologist Dr. Robert C. Atkins in 1972 and uses a process called ketosis to burn fat as fuel instead of glucose. To achieve this, the overall intake of carbohydrate, which the body turns into glucose, needs to be severely restricted. The initial stage of the New Atkins diet only allows for 20g of net carbs per day (an average slice of white bread contains 15g of net carbs). Along with all grain based carbohydrates, many vegetables are also banned for the initial stages of the diet as they contain high levels of starch. The bulk of the diet is made up from protein in the form of meat, fish and eggs, low carbohydrate vegetables such as salad vegetables, fruit, and dairy. A low carb diet is very good for rapid weight reduction and is ideal for people who are very overweight. Because of its quick results, it’s considered a good diet plan for motivation as people can see the effects of the Low Carb plan rapidly while not struggling with hunger. The Low Carb diet is often used to treat ailments such as diabetes, Chronic Fatigue Syndrome, Polycystic Ovarian Syndrome, and even extreme epilepsy. Low GI diets such as the South Beach diet and Zone diet concentrate on the Glycemic Index, which rates all foods on its index with a number between 1 and 100 with foods numbered 55 or less as low GI, 56-69 as medium GI, and above 70 as high GI. Food are categorized as low, medium or high GI by looking at a number of elements. 1. Does a food contain carbohydrates? Any foods that don’t contain carbohydrates such as meat, fish, eggs, dairy and fats have zero effect on the body’s ability to product glucose so are considered low GI. 2. How much starch does a food contain? Raw foods that contain starch are usually in a compact form that the body will be unable to break down easily, so they are therefore low GI. However, starchy foods such as grains that have been processed have had this compact form altered so that the body can more easily digest them and turn into glucose. 3. How much fiber does a food contain? The more fiber a food contains, the slower the body can break it down and turn it into glucose. Therefore most grains and beans are either low or medium GI. 4. What kind of sugar does a food contain? Along with glucose, there are another 3 types of sugar. Fructose found in fruit, and lactose found in dairy are both slow to break down and convert into glucose so are low GI. Sucrose has a medium GI. 5. Does the food contain fat? Fat does not effect glucose, but it does slow down the speed of food in your system so therefore has an overall slowing effect in the production of glucose in your body. 6. How acidic is a food? Acidity also slows a food down through the digestive tract, thus helping to slow the rate at which it is converted to glucose. The basis of a low GI diet is to ensure that you eat only foods that have low or medium GI ratings and that you avoid high GI foods. Although, if you do eat high GI foods they should be small portions and be eaten alongside low GI foods that will decrease the overall GI rating of the meal. As you can see, both diet plans have many similarities, and both have been proven to be exceptional aids for weight loss. Both plans are to be treated as lifestyle changes rather than short fix diets and the long term effects of reducing your overall processed, starchy carbohydrates has proven healthy benefits that more and more people are realizing. The Atkins Diet Revolution has undergone a radical change over the post 40 years. Read about whether the “new Atkins” approach to induction is as effective as the original induction phase developed by the good Doctor himself back in the ’60s. The Atkins Diet is immediately thought of as the original low carb diet that all other low carb diet variants are based on. 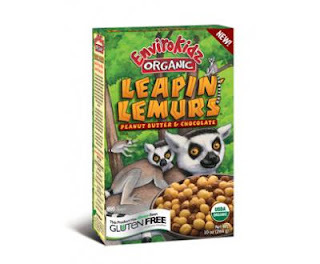 And more recently, the Atkins company has been making a comeback, offering a wide range of low carb bars, low carb shakes, and now even low carb pasta to help people add some sweets and starches back into their low carb lifestyle without breaking their diet. But the fact is, the new Atkins Diet is quite different from Dr. Atkins’ original Diet Revolution — especially in the “induction” phase. Years ago, when I first decided to investigate low carb diets, I picked up Atkins’ original Diet Revolution book in paperback. Not knowing that he had in fact published a new addition of his diet, I digested his book carefully, committing to memory the science, rationale, and philosophy behind Dr. Atkins’ proven methods for helping people lose weight without being hungry. Recently, however, I happened across some of the new literature that Atkins’ brand and company has published about “The New Atkins” Diet. I was incredibly surprised to see how the diet has changed from Dr. Atkin’s original low carb diet plan from the late 1960s! The following article acts as a guide for low carb dieters to understand the difference between the new Atkins versus the old Atkins Diet Revolution in the induction phase. For those of us on low carb diets; the humble potato is one of the biggest enemies out there, along with regular pasta and rice. Their many forms often tease and tempt us into submission, and trying to find new and tasty ideas for dinner that don’t involve these staples can be difficult. Luckily, help is at hand and we’ve come up with a list of low carb side dish ideas that will help you in substituting these starchy high carb foods for low carb alternatives that taste great. A much under-used vegetable and often hidden under cheese sauce; cauliflower makes for a great alternative to potatoes. Instead of serving mashed potatoes, try boiling or steaming some cauliflower until soft and then pureeing with butter, milk and some grated nutmeg. Baked cauliflower lightly spiced with ground cumin and cilantro seeds makes a delicious side dish for curries and other spicy foods in place of rice or potatoes. Cauliflower can also be used to thicken low carb soups by adding tender steamed florets to your soup before blending. It may not be the prettiest of vegetables, but celeriac is high in potassium, vitamin C and phosphorus. Tasting faintly of celery, celeriac is a fabulous low carb alternative to mashed or roasted potatoes, although it does require a longer cooking time. Make sure you add your peeled celeriac to boiling water though as starting to cook it in cold water can make it very bitter. A fantastic way to almost eliminate all carbs from a meal is to use vegetables as a pasta alternative. Spaghetti squash has a quarter of the calories and carbs of regular spaghetti so makes an excellent choice. Vegetable strips such as eggplant can be used as layers in mousaka, and zucchini can be used in the same way for lasagna dishes. 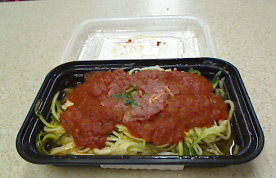 Long, thin zucchini strips can be also be used as a substitute for spaghetti or other pasta served with your favorite sauces. Shirataki Noodles & Rice . . . on a Low Carb Diet? Shirataki noodles are traditional Japanese noodle made from tofu that have a very low net carbohydrate count, and are extremely low in calories. They can be used in any recipe that you would use Chinese noodles or even pasta. They simply need to be rinsed under cold water and then heated up and added to your dish. Alternatively you can dry roast the noodles in a hot skillet pan for a couple of minutes until you start to hear them squeak, dry roasting the noodles gives them a more pasta-like consistency and able to absorb sauces better. Shirataki rice is also available for low carb dieters. This amazing rice is a water-soluble dietary fiber and has zero carbs, zero GI, zero gluten and zero calories! Unlike the starch-laden, carb-heavy potato, pasta can be made into a low carb staple. By using low carb flour to make the pasta, the manufacturers can reduce the overall carbohydrate content while still keeping the fiber content. There are now lots of varieties of low carb pasta available for us to choose from that are high in fiber but low in carbs, and with a lower glycemic index than regular pasta it’s a perfect choice for those on a low GI or low carb Aitkins-style diet. You don’t even have to go without comfort foods such as Mac & Cheese as Dixie Diner offer a low carb version of this all-American classic that has just 3 net carbs. *Michael Nace is a low carb blogger for Linda’s Diet Delites.